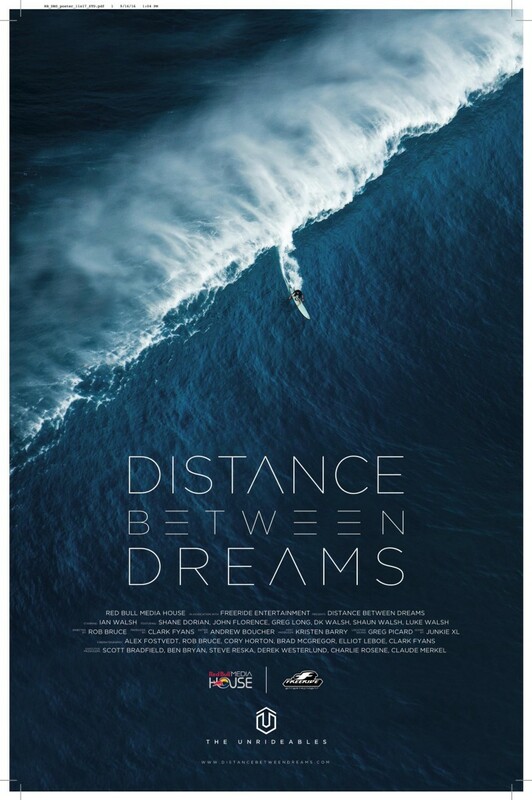 In “Distance Between Dreams,” the most historic year in big-wave surfing comes to life through the eyes of iconic surfer Ian Walsh, as he sets mind and body in motion to redefine the upper limits of what’s considered rideable. With massive El Niño-powered swells building across the Pacific, Ian, Shaun, DK and Luke Walsh band together in a way that only brothers can to progress surfing to unimaginable heights. Big-wave surfing’s transition from Jet Ski assists to paddling-in raises the stakes, putting Walsh’s intense physical and mental training, the latest technology, swell modeling, safety team and his brothers to the ultimate test. Surfers John John Florence, Greg Long, Shane Dorian and more link up with Walsh as he rides an emotional rollercoaster through this momentous winter. The second feature in Red Bull Media House’s “The Unrideables” franchise, “Distance Between Dreams” invites viewers right into the heart of the action with first-person perspective, state-of-the-art cinematography and captivating sound. Through unprecedented access, prepare to truly experience Walsh’s quest to survive and thrive in one of the most hostile environments on Earth. A World Meteorological Organization expert committee has established a new world record significant wave height of 19 meters (62.3 feet) measured by a buoy in the North Atlantic. 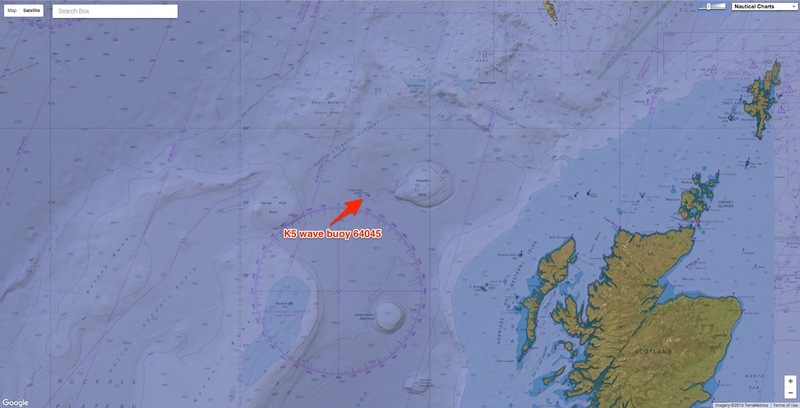 The wave was recorded by an automated buoy at 0600 UTC on 4 February 2013 in the North Atlantic ocean between Iceland and the United Kingdom (approximately 59° N, 11° W). It followed the passage of a very strong cold front, which produced winds of up to 43.8 knots (50.4 miles per hour) over the area. Note that this is "significant" wave height -- in essence, what an observer would have seen if he/she averaged over 15-20 waves passing by the buoy -- that is a much better thing than "rogue waves" which really cannot be accurately measured. According to one of our of panel's "wave experts": "There have been many more less reliable estimates of rogue waves from other platforms, and from satellite SAR. These are generally unverifiable, since there is no ground truth for the satellite, and the others tend to be from pitching and rolling platforms such as ships, and estimates are often based on damage to the superstructure, which may not have been level at the time." Significant wave height recorded is four times the RMS value of the water level above the average level of the water surface measured over a 17½ minute period. The factor of 4 applied to the RMS value is because the waves are trochoidal in nature. The ‘average’ wave period, again over a 17½ minute sample, is the average of the periods over 7 successive 2½ minute samples (each determined from the number of wave cycles in the sample). 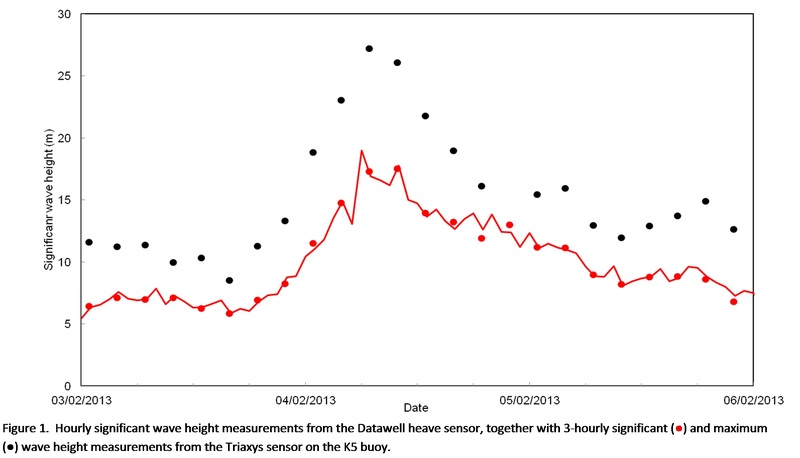 Figure (above) shows the hourly significant wave heights from the Datawell heave sensor, together with the wave measurements from the Triaxys sensor. The Committee consisted of scientists from the United Kingdom, Britain, Canada, the United States of America and Spain. 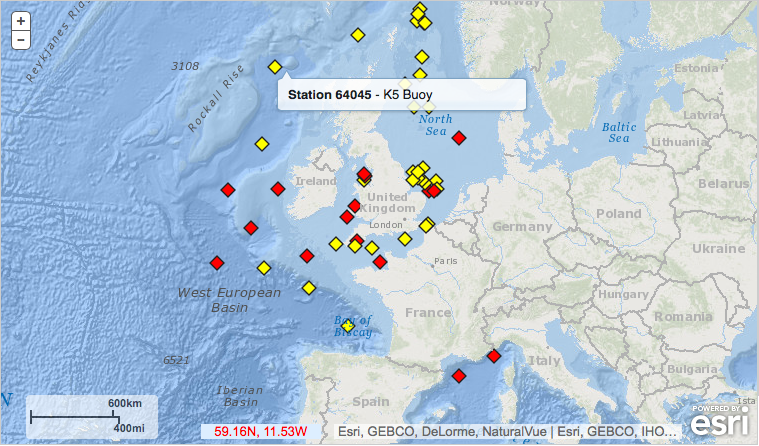 The buoy (K5) which recorded the wave is a part of the UK Met Office’s network of Marine Automatic Weather Stations. 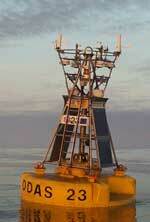 Moored and drifting buoys form a vital part of an extensive international observing network coordinated by WMO and its partners. They complement ship-based measurements and satellite observations which monitor the oceans and forecast meteorological hazards on the high seas. 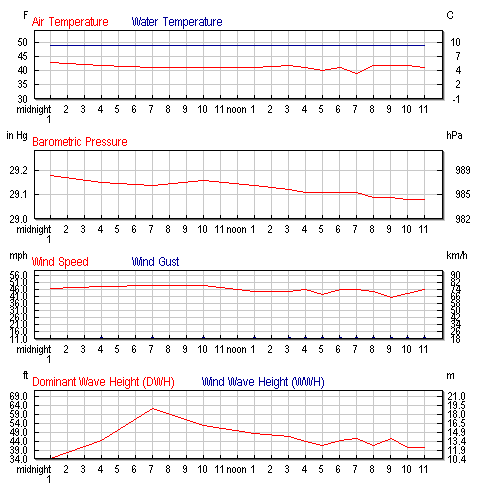 During the period of the highest waves the wind speeds measured on the buoy were over 35 kn for the 12 hours preceding the highest waves, with a maximum wind speed reported of 43.8 kn, as shown in Figure 2 above. 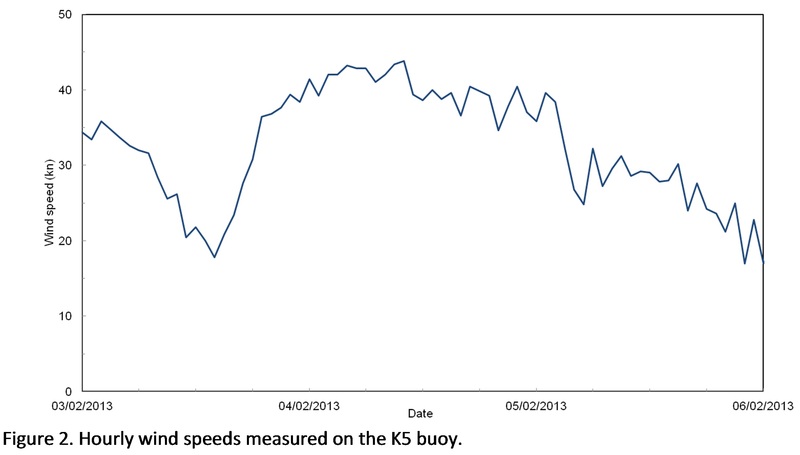 The winds were measured using a Gill windsonic (acoustic) anemometer on the buoy at around 3½m above sea level. The synoptic situation at 0600 on 4th February shows an intense depression to the north of the buoy with prolonged strong westerly to northwesterly winds at the K5 station. Record was evaluated by the committee of J. Turton, M. Brunet .T. Peterson, V. Swail, and R. Cerveny. “This is the first time we have ever measured a wave of 19 meters. It is a remarkable record,” said WMO Assistant Secretary-General Wenjian Zhang. “It highlights the importance of meteorological and ocean observations and forecasts to ensure the safety of the global maritime industry and to protect the lives of crew and passengers on busy shipping lanes,” he said. “We need high quality and extensive ocean records to help in our understanding of weather/ocean interactions,” said Dr Zhang. “Despite the huge strides in satellite technology, the sustained observations and data records from moored and drifting buoys and ships still play a major role in this respect,” he said. Wave height is defined as the distance from the crest of one wave to the trough of the next. The term “significant wave height” means the average of the highest one-third of waves measured by an instrument, and is comparable to what an observer would see as an average of about 15-20 well-formed waves over a period of about 10 minutes. 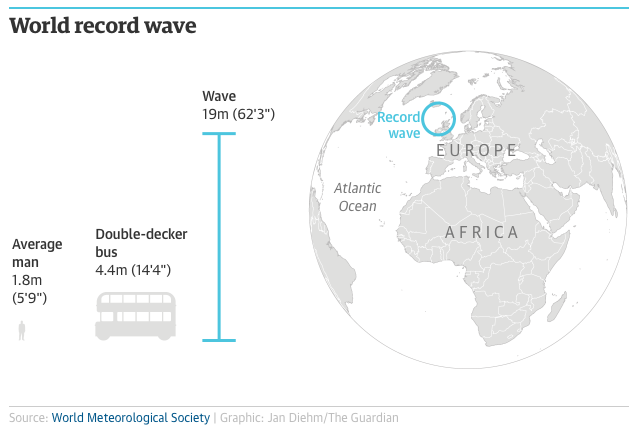 The highest waves typically occur in the North Atlantic, rather than the Southern Ocean. Wind circulation patterns and atmospheric pressure in the North Atlantic in winter leads to intense extra-tropical storms, often so-called "bombs". This means that the area from the Grand Banks underwater plateaus off the Canadian coast around Newfoundland to south of Iceland and to the west coast of the UK, including the Rockall Trough, are prime candidates for wave records. “The new world record will be added to the official WMO archive of weather and climate extremes which is being constantly updated and expanded thanks to continued improvements in instrumentation, technology and analysis,” said Randall Cerveny, Joint Rapporteur on World Records of Climate and Weather Extremes for WMO. “Oceans cover some 70 per cent of the world’s surface. Ocean observations are therefore critical to understanding and forecasting our weather and climate,” he said. The archive includes the world’s highest and lowest temperatures, rainfall, heaviest hailstone, longest dry period, maximum gust of wind, as well as hemispheric weather and climate extremes. A WMO committee of experts earlier this year established two new records - the longest reported distance and the longest reported duration for a single lightning flash in, respectively, Oklahoma (United States of America) and southern France. Seventeen years and more than 10 billion euros ($11 billion) later, Europe's Galileo satnav system is set to go live on Thursday, promising to outperform US and Russian rivals while boosting regional self-reliance. Initial services, free to use worldwide, will be available only on smartphones and navigation boxes already fitted with Galileo-compatible microchips. Some devices may only need a software update to start using the new technology, and European Commission spokeswoman Mirna Talko said several smartphone giants were already making chips compatible with it. "It will be the first time that users around the world will be able to be guided by Galileo satellites," said Lucia Caudet of the Commission, which funds the project. Somewhat fuzzy at first, the signal will be boosted with help from satellites in the US military-run GPS system, growing stronger over time as orbiters are added to the now 18-strong Galileo network circling 23,222 kilometres (14,430 miles) above Earth. According to its proud parents, the Commission and European Space Agency (ESA), Galileo should be fully operational by 2020, providing time and positioning data of unprecedented accuracy. "GPS allows a train to know which area it is in—Galileo will allow it to identify the track it is on," according to Jean-Yves Le Gall, president of France's CNES space agency, one of ESA's 22 country members. Such precision would also be invaluable for safer driverless cars and nuclear power plants, as well as better telecommunications. Find out which of your devices use the EU's Galileo Satellite Constellation using the GSA's new online search tool. The civil-controlled service is also of great strategic importance for Europe, which relies on two military-run services—GPS and Russia's GLONASS, which provide no guarantee of uninterrupted service. It will be interoperable with these, but also completely autonomous. "Having a system that is somewhat independent of the US system that is controlled by the military is probably a good thing," explained George Abbey, a senior fellow in space policy at Rice University in Houston, Texas. This would be especially pertinent "if there were some conflicts or disagreements... that would cause the United States to have to limit GPS," he told AFP. Named after Italian astronomer Galileo Galilei, the project was first approved with an initial budget of around three billion euros and plans to be operational by 2008. But it has suffered several technical and budgetary setbacks, including the launch of two satellites into the wrong orbit in 2014. The European Commission expects the project will ultimately be an important commercial venture. Almost 10 percent of Europe's gross domestic product is thought to depend on satellite navigation today—a figure projected to grow to about 30 percent by 2030. By 2020, says the commission, the global satnav market will be valued at about 244 billion euros. EGNOS is a satellite based augmentation system that used a network of ground stations and satellites to increase the accuracy and integrity of existing positioning system, like the GPS or GLONASS. It sends a correction signal to EGNOS enabled receivers that can improve the accuracy of the positioning and provide information on the reliability of the system at any given time. GALILEO is Europe's state-of-the-art global satellite navigation system that will provide a highly accurate, guaranteed global positioning service under civilian control. The fully deployed system will consist of 30 satellites and the associated ground infrastructure. Galileo will be inter-operable with GPS and GLONASS, the two other global satellite navigation systems. Galileo itself is expected to add some 90 billion euros to the EU economy in its first 20 years. The system's groundbreaking accuracy is the result of best atomic clocks ever flown for navigation—one per satellite—accurate to one second in three million years. A mere billionth-of-a-second clock error can mean a positioning error of up to 30 centimetres (12 inches). Galileo also has more satellites than either GPS or GLONASS, and better signals which carry more information. With these features, Galileo's free Open Service will be able to track positions to within a metre (3.3 feet), compared to several metres for GPS and GLONASS. Its signal will eventually reach areas where none is possible today—inside traffic tunnels and on roads where high buildings shield radio waves from some satellites. A paying service will allow clients to track locations even closer, to within centimetres, and governments will have access to an encrypted continued service for use in times of crisis. Screen recorded (Nov. 29) from a BQ Aquaris X5 plus smartphone, today the only Galileo compatible Android smartphone. Another key feature is a service allowing rescuers to locate people lost at sea or in the mountains much faster than before. Currently, satnav technology can take up to three hours to track a person to within a 10-kilometre (six-mile) range. "With Galileo's Search and Rescue Service, the detection time is reduced to 10 minutes and the localisation is reduced to less than five kilometres," Caudet told AFP. Satellite navigation works by ultra-precise clocks in orbit broadcasting their time and position to Earth via radio waves travelling at the speed of light. Anyone with a receiver can combine data from at least three satellites to determine their position, speed and local time on Earth. Europe's Galileo satnav system, first approved in 1999, had a difficult birth—taking 17 years and more than triple the original budget to get to the point of going live. December 1999: The European Commission formally approves Galileo, a joint project with the European Space Agency, with a budget of between 2.2 billion and 2.95 billion euros ($2.34-3.14 billion). The project "to safeguard European strategic needs" is set for completion in 2008. April 2008: After failing to raise private sector funding, the Commission—the European Union's executive—takes over the project with a new estimated budget, entirely taxpayer-funded, of 3.4 billion euros until 2013. A further 7 billion euros is budgeted for the 2014-2020 period, according to France's CNES space agency, an ESA member. October 2011: The two first Galileo satellites are launched into orbit, followed by two more in 2012. March 2013: The four satellites pinpoint the system's first-ever ground location, with an accuracy of between 10 and 15 metres (32 to 49 feet). One of the orbiters develops antenna problems, but can still transmit on one frequency. August 2014: After a more than year-long delay over "technical difficulties", satellites five and six are launched into a lopsided, elliptical orbit of little use for satellite navigation. Subsequent launches are delayed to investigate the cause—frozen fuel pipes onboard the Russian Soyuz rocket. December 2016: With 18 satellites in orbit, Galileo is set to go live with initial services on Thursday. The commission has already ordered eight more orbiters, for launch in 2017 and 2018, with the last four in the 30-satellite constellation yet to be confirmed. In late August 2016, sunlight returned to the Antarctic Peninsula and unveiled a rift across the Larsen C Ice Shelf that had grown longer and deeper over the austral winter. Satellites spotted it in natural-color imagery. By November, the arrival of longer days and favorable weather made it possible for scientists to take a closer look. These photographs show close and wide views of the rift from the vantage point of NASA’s DC-8 research aircraft. NASA scientist John Sonntag snapped the photos on November 10, 2016, during an Operation IceBridge flight. The mission, which makes airborne surveys of changes in polar ice, completed its eighth consecutive Antarctic deployment later that month. is likely to disintegrate before the end of this decade. The rift in Larsen C measures about 100 meters (300 feet) wide and cuts about half a kilometer (one-third of a mile) deep—completely through to the bottom of the ice shelf. While the rift is long and growing longer, it does not yet reach across the entire shelf. When that happens, Larsen C will shed an iceberg about the size of Delaware. Operation IceBridge, a NASA airborne survey of changes in polar ice, recently completed its eighth consecutive Antarctic deployment. This page contains a wrapup video for the entire mission, as well as some footage over the Antarctic Peninsula's Larsen C Ice Shelf, and a few high definition still images. One of this year’s missions flew over a massive rift in the Larsen C.
Ice shelves are the floating parts of ice streams and glaciers, and they buttress the grounded ice behind them; when ice shelves collapse, the ice behind accelerates toward the ocean, where it then adds to sea level rise. Larsen C neighbors a smaller ice shelf that disintegrated in 2002 after developing a rift similar to the one now growing in Larsen C.
The IceBridge scientists measured the Larsen C fracture to be about 70 miles long, more than 300 feet wide and about a third of a mile deep. 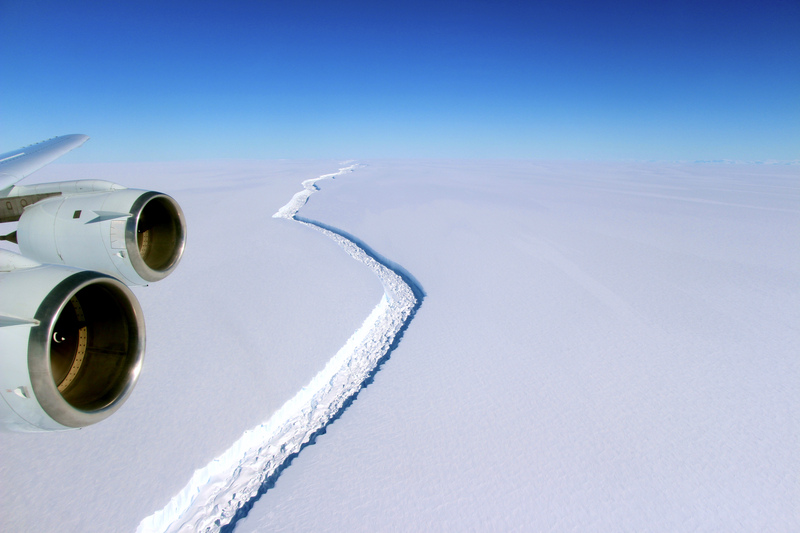 The crack completely cuts through the ice shelf but it does not go all the way across it – once it does, it will produce an iceberg roughly the size of the state of Delaware. 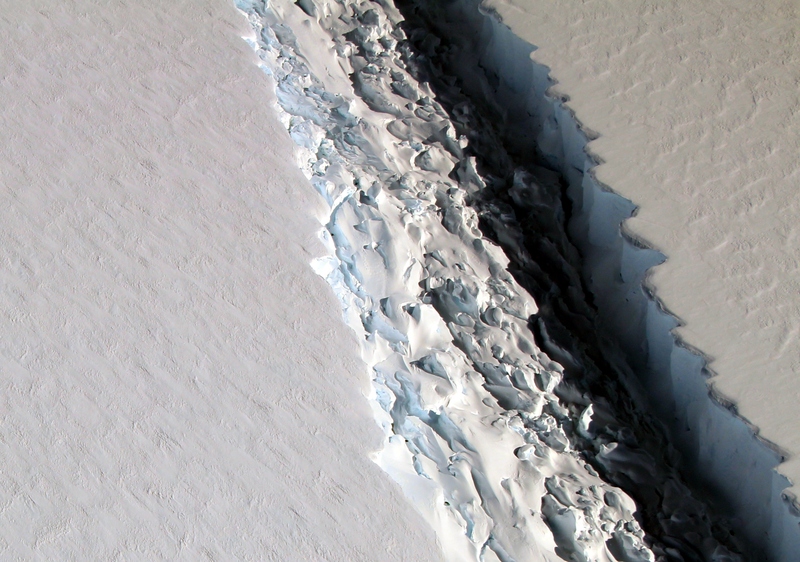 Cracks and calving of ice from the front of an ice shelf are normal. Shelves are fed by glaciers and ice streams coming from the interior of the continent. They advance into the ocean until a calving event takes place. The shelf front retreats and then advances again. The whole cycle can occur over the span of a few decades. But calving that happens faster than a shelf can re-advance can mean trouble for an ice shelf. 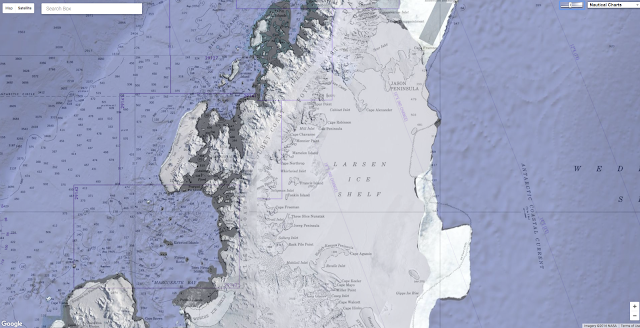 For example, large and frequent calving events at Larsen B preceded that shelf’s final period of rapid disintegration, which occurred in just six weeks in 2002. Whether Larsen C will respond in a similar way remains to be seen, but that’s one reason why scientists plan to make observations before and after the next calving event. Ice shelves float, so they do not directly contribute to sea level rise. They are important, however, because they buttress land ice and keep it inland. If a shelf disintegrates, glaciers that feed it can flow more quickly out to sea—a process that directly increases sea level. Google has partnered with the European Commission’s Joint Research Centre to produce the greatest views of water on the surface of Earth ever. The images show changing water levels, and reveal some of the stories behind the changes from the past three decades to see how they "have shaped the world over time, in unprecedented detail." Timelapse is a global, zoomable video that lets you see how the Earth has changed over the past 32 years. Explore the world through time at https://earthengine.google.com/timelapse. The project took more than three years and involved thousands of computers downloading 1.8 petabytes of data from the USGS/NASA Landsat satellite program. Each pixel in 3 million satellite images, going back to 1984, was analysed by an algorithm developed by the Joint Research Centre running on the Google Earth Engine platform. More than 10 million hours of computing time was needed for this, roughly equivalent to a modern 2-core computer running day and night for 600 years. From this, the researchers were able to establish that, over the past 32 years, 90,000 square kilometres of water - the equivalent of half of the lakes in Europe - have vanished, while 200,000 square kilometres of new, mostly man-made water bodies appeared. The research findings and the maps, published in the journal Nature, can be explored on the Global Surface Water Explorer site. The data is also available in Google Earth Engine to help designers, engineers and other organisations research, use, and download. The maps, statistics and stories, for example, can help global water security, agricultural planning, preparing for disasters, public health, climate research and so on. The water research used the same engine recently involved in creating Google's fascinating Timelapse interactive map. Timelapse was first released in 2013 and a recent update added four more years of satellite imagery, petabytes of new data and sharper photos than in any previous version. Users can now explore Antartica’s shifting glaciers, Bangkok’s sprawling urban growth and the rapidly drying Aral Sea. 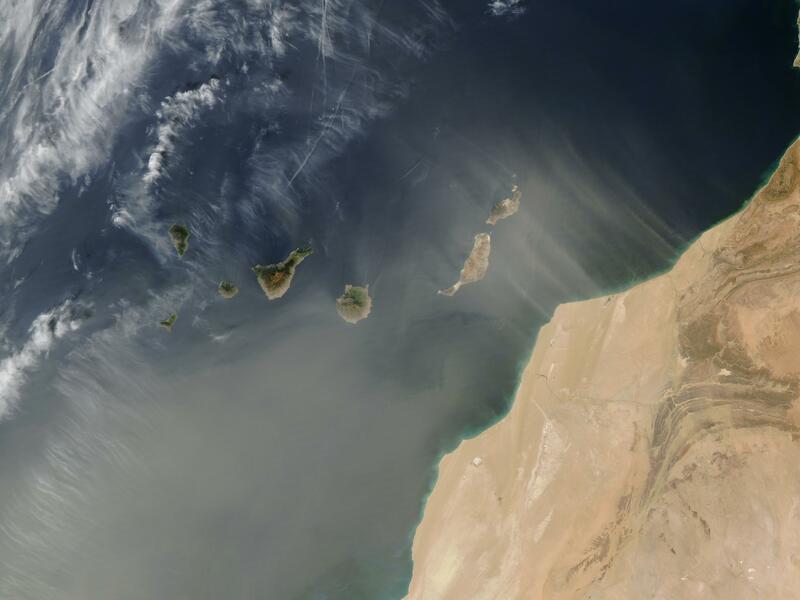 Dust from western Africa in the centre of the picture, pushing across the Atlantic Ocean on easterly winds in June 2014. The way in which man-made acids in the atmosphere interact with the dust that nourishes our oceans has been quantified by scientists for the first time. In an international study led by the University of Leeds, researchers have pinpointed how much phosphate “fertiliser” is released from dust depending on atmospheric acid levels. This portrait of global aerosols was produced by a Goddard Earth Observing System Model, Version 5 simulation at a 10-kilometer resolution. Dust (red) is lifted from the surface, sea salt (blue) swirls inside cyclones, smoke (green) rises from fires, and sulfate particles (white) stream from volcanoes and fossil fuel emissions. High-resolution global atmospheric modeling run on the Discover supercomputer at the NASA Center for Climate Simulation at Goddard Space Flight Center, Greenbelt, Maryland, provides a unique tool to study the role of weather in Earth's climate system. Phosphorus is an essential nutrient for all life, and when it falls into the ocean, it acts as a fertiliser that stimulates the growth of phytoplankton and marine life. The new study allows scientists to quantify exactly how much phosphate “fertiliser” is released from dust depending on atmospheric acid levels. Dr Anthony Stockdale, from the School of Earth and Environment at Leeds, is lead author of the study. He said: “The ability to quantify these processes will now allow models to predict how pollution on a global scale modulates the amount of fertiliser released in airborne dust before it falls into the oceans. Co-author Professor Athanasios Nenes, of Georgia Institute of Technology, said the implications went beyond the carbon cycle and climate. “The Mediterranean is one of many locations of the globe where pollution and dust mix frequently,” he said. For the first time, a NASA satellite has quantified in three dimensions how much dust makes the trans-Atlantic journey from the Sahara Desert to the Amazon rainforest. Among this dust is phosphorus, an essential nutrient that acts like a fertilizer, which the Amazon depends on in order to flourish. The new dust transport estimates were derived from data collected by a lidar instrument on NASA's Cloud-Aerosol Lidar and Infrared Pathfinder Satellite Observation, or CALIPSO, satellite from 2007 though 2013. An average of 27.7 million tons of dust per year – enough to fill 104,980 semi trucks – fall to the surface over the Amazon basin. The phosphorus portion, an estimated 22,000 tons per year, is about the same amount as that lost from rain and flooding. The finding is part of a bigger research effort to understand the role of dust and aerosols in the environment and on local and global climate. Phosphorus is one of the essential elements for life and is a critical component of building blocks such as DNA. 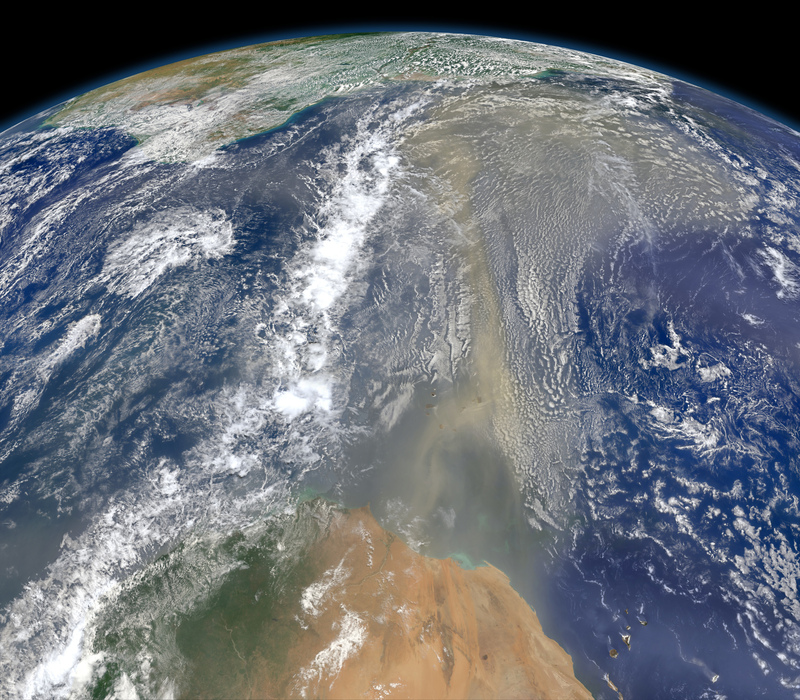 Dusts, from deserts such as the Sahara, are an important source of phosphorus to Earth’s oceans. The mineral-containing dust is generated in copious amounts during storms and is found throughout the atmosphere. Most of the phosphorus in this dust is in an insoluble form that the microscopic plants of the oceans – phytoplankton and diatoms – cannot get at. Known as apatite, the phosphorus in the dust is similar to the substance found in our teeth and bones. Acids can be released naturally into the atmosphere from volcanic eruptions and from living organisms. But the burning of fossil fuels is currently the most significant source of atmospheric acids. In the same way that acid produced by the bacteria in our mouths can cause tooth decay, so can acids in the atmosphere dissolve apatite and turn it into a form of phosphorus that can be used by marine organisms, the study authors said. As well as researchers from Leeds, Georgia and Haifa, experts from three institutions in Greece, one in Israel, one in Germany and two others in the UK worked on the findings, published today in Proceedings of the National Academy of Science of the USA. it also served Norway and the United Kingdom. Smyril is the Faroese word for the merlin.